Thank you for taking some time to learn more about Nazareth Retreat Center. We welcome a large variety of groups and individuals to host their retreats on our grounds throughout the year. Visiting groups and individuals may set their own agenda, bring their own speakers if they wish, and, in general, arrange their day according to their own desires. • Meeting rooms for both small and large groups are available. Light catering (coffee, tea, sweet bread) can be delivered to these rooms. Several are equipped with modern audiovisual technology such as microphones and projectors. • Optional meal service (breakfast, lunch, and dinner) prepared daily by Nazareth Food Service is available in the Motherhouse Dining Room. • Free Wi-Fi is provided throughout campus. • Small fitness center (open every day from 8 a.m. – 8 p.m.). • Licensed massage therapy (Call Nancy at 502.331.4519 for availability). • Spiritual direction (Call Phyllis at 502.460.1103 for availability). 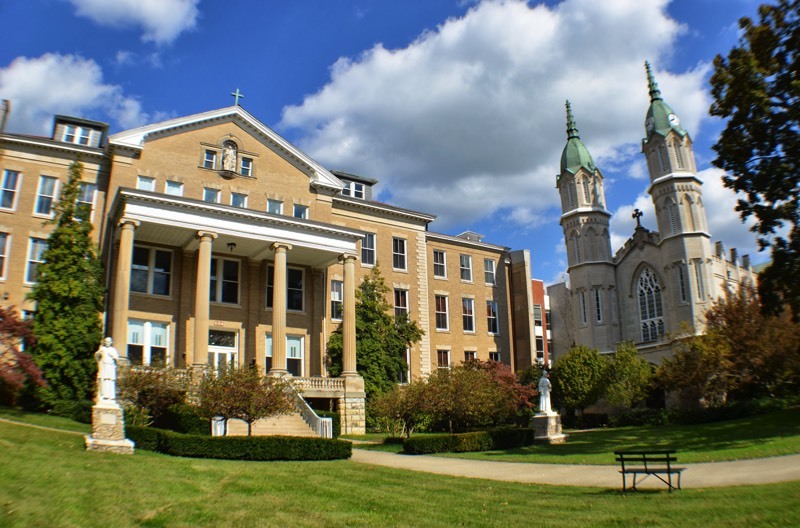 Nazareth Retreat Center is a ministry of the Sisters of Charity of Nazareth. Our nightly rates can be located here. Groups that align with the mission of the Sisters of Charity of Nazareth may be eligible for a scholarship. All retreatants are welcome to attend these opportunities and integrate them into their retreat as desired. Monday – Friday: 4:45 P.M.
Monday – Saturday: 10:50 A.M.
Nazareth Retreat Center is also pleased to offer an outdoor prayer labyrinth that is free for all to use. For those unfamiliar with this ancient prayer method, instructional booklets can be provided. Know someone that could use the gift of silence, peace, and prayer? Gift certificates are available here.